My Raleigh Strika BMX thunders around the top of our cul-de-sac and over the milk crate and plywood improvised ramp… Bah-dumph! Another jump safely landed, I finish my daring manoeuvre with an exaggerated wheelie in a vain effort to impress Colin from number 7’s older sister. 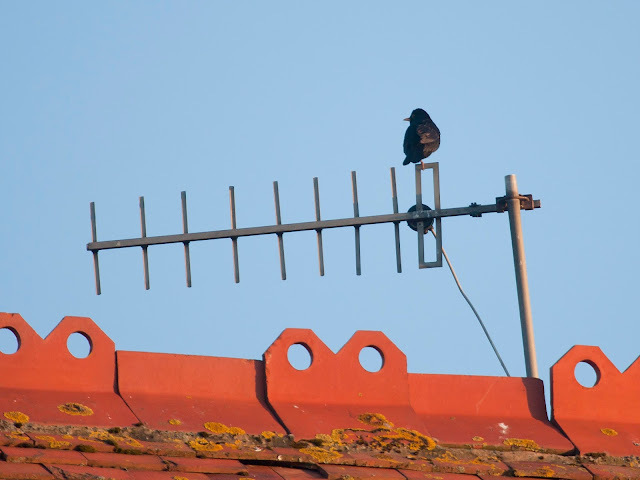 It is heading towards the end of another peaceful day round our way in the mid-80’s and, as the sun begins to set, Blackbirds start up the sound of the suburban summer. One male always used to sing on the TV aerial of our house (satellite dishes were still the exception rather than the rule then) and I think it nested once in the ivy that covered our back fence. That liquid lyrical song of the Blackbird was occasionally punctuated by the screams of Swifts swirling overhead. 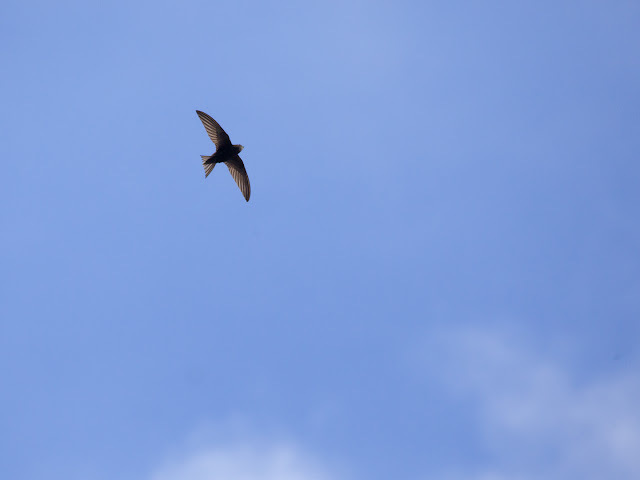 One of my earliest birdwatching memories is lying on my back watching the Swifts wheeling around high above the back gardens of our close. Mum is cutting the grass in ours, the latest must-have Swedish made hover mower sounding like an angry bee caught inside a hairdryer. There is a small bare patch near the top of the lawn: the crease for our back garden cricket games. With flower borders for boundaries and the small size of our plot, scores in excess of 200 not out were frequently recorded. Well, if England weren’t going to beat the Aussies in a test match, I would. A no-bounce-over-the-fence was automatically out. Beyond that ivy covered fence where the Blackbirds once nested is the large village green. It is circled by a quiet road that unlike our other road off our cul-de-sac, the busy Townfield Lane, we didn’t need permission to cross. Here we would play footy until called in for tea. 20 kids chasing a flyaway football with no thought for positions or tactics. Good times. I don’t recall it ever raining either. 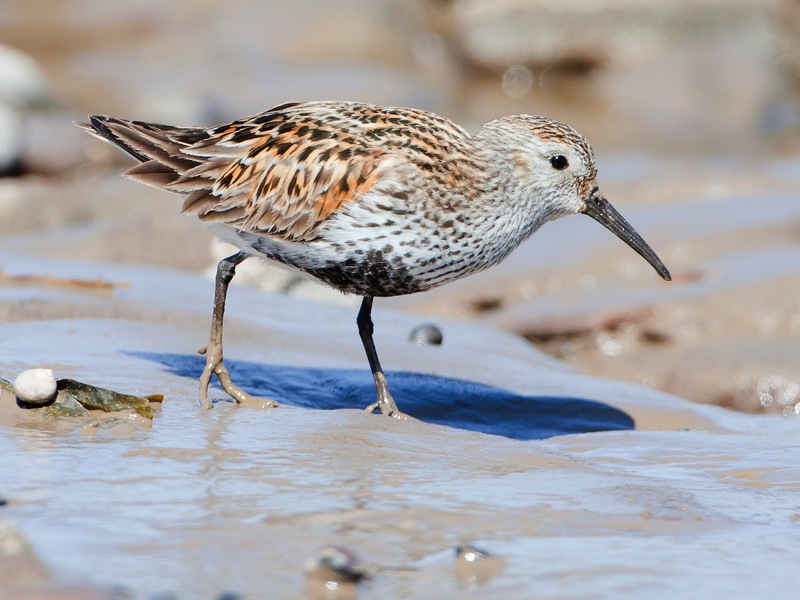 What has all this feel-good nostalgia have to do with Dunlin on Hilbre Island? I am in the new hide, the homemade Mudflat 3000 MkII. It has been dropped at the eastern side of the island on a flatish, bare expanse of sandstone between two ragged patches of frilly dark brown seaweed. Even though I say so myself, it is beautifully camouflaged and later in the day it will totally fool a couple of gossiping Lifeguards whose feelings about a colleague I will not repeat here. The origin and specification of the Mudflat 3000 mkII together with early results from it will be presented in an upcoming post, right now I’m concentrating on the Dunnies. I am ensconced in the MF3K mkII when a brief shower of rain passes overhead. It has been a largely fine day with just a little high cloud so this turn in the weather is unexpected and a little disappointing. It doesn’t last long though, but long enough to remind me of rain on tent roofs during holidays when I was a kid. From there my mind wanders to endless summers on BMXs and results in the opening passage to this story. Although such is the fickle nature of young love/infatuation I can no longer remember the name of Colin from number 7’s older sister. It may have been Susan. I have reached an age when I can be genuinely nostalgic and this happens most often when I am waiting patiently for something to wander close enough to my hide to photograph. Then, for better or worse, those thoughts often find their way into the stories I post here. 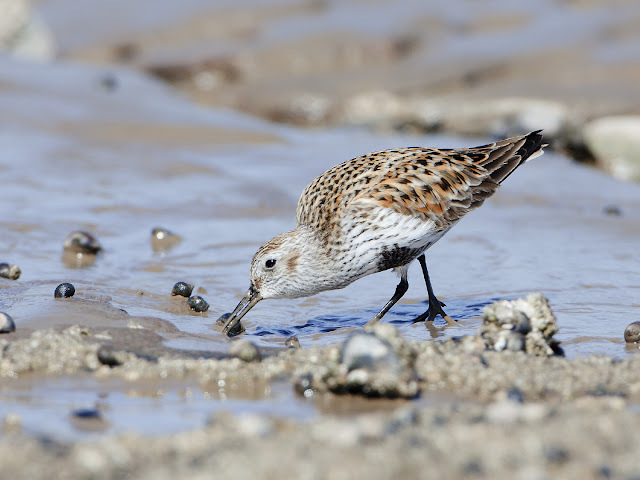 Some Dunlin are approaching and I banish the childhood memories and concentrate of the camera settings and exposure for the pictures I’m about to take. They scurry over the barnacle strewn rocks, investigate periwinkles and pick at the seaweed. They seem happiest in the puddles of mud that accumulate between the reefs of reddish sandstone. The mud is the colour and consistency of a good chocolate custard and the Dunnies probe it with a swift stitching motion. A successful stitch sees the head thrown back and the unlucky prey item hungrily swallowed. They look in the rock pools too, I wonder if they catch their own reflection. 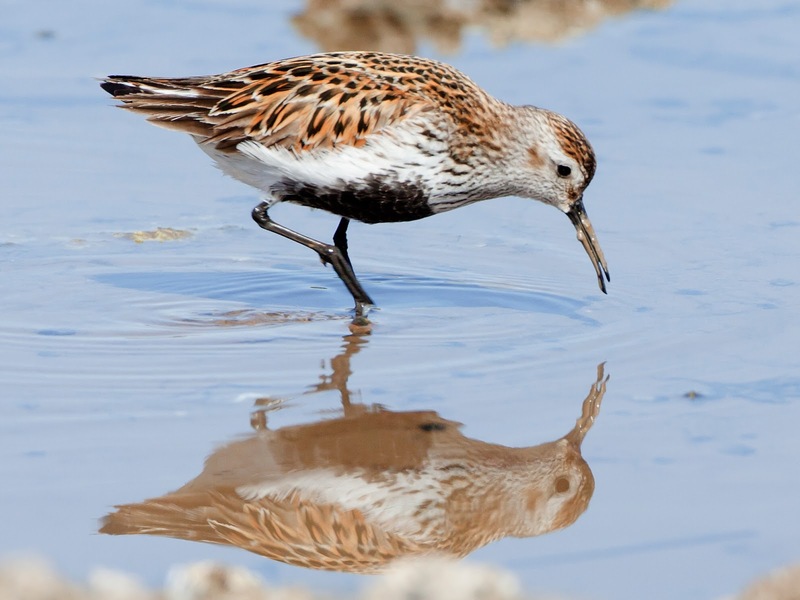 This group of Dunlin wander past and out of range and I’m left looking at the puddle of custard-like mud. I have a rather Pavlovian response to that thought and reach inside the hide for some munchies. My wife’s banana loaf with toffee frosting. Once I have wolfed that treat down I’m left with uncomfortably sticky fingers from the frosting. Stuck in the hide and not wanting to spook the next set of approaching birds I wipe my hands of the backside of my trousers and mentally add baby wipes (of which we have a huge amount now we have a young daughter) to my camera bag kit list for next time. More Dunnies drift in front of the MF3K MkII and I take further pictures, swivelling dials, thumbing buttons and scrolling through menus to adjust the exposure again. The sun is shining now and the shutter is whirring, images accumulate on the memory card. Good times. 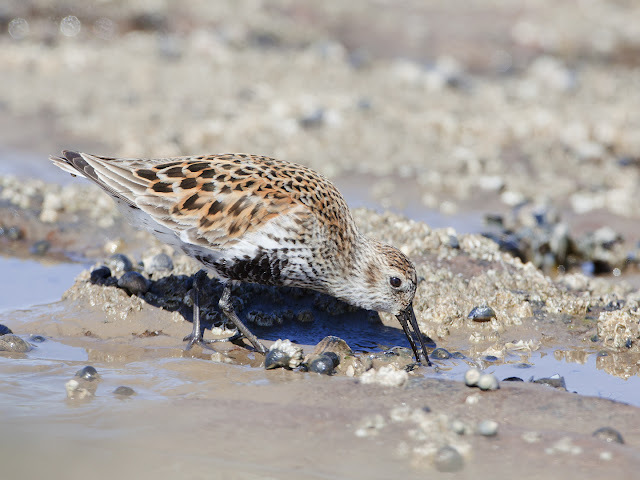 The Dunlin still seem to prefer the mud puddles although the mud has dried a little in the warm sun, it is now more Angel Delight-ish than custardy. Will I, in the years to come, look back on these untroubled days with warm and fuzzy nostalgia for time spent in the hide with just Dunlin for company?